Happy Leap Day from the Swarovski Leap Frog Army! February 29, is a day that we seldom see on newspapers, checks, bills, etc. But in 2012, here it is…..so enjoy the unusual date. Happy Leap Year Day! Swarovski has produced about 4 different leap frogs which are a part of the Silver Crystal product line. 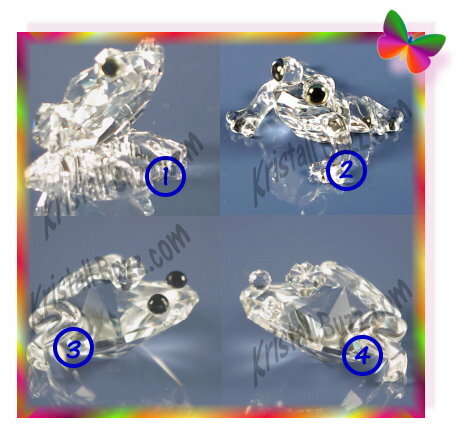 Swarovski Frog – This Swarovski frog has the product identification #7642 000 001 / 183 113.. This leap frog is clear and is a part of the “In the Secret Garden” theme group. The Frog was produced 1994 – 1996, so it will only have the Swan logo. Swarovski Baby Frog – This Swarovski frog is clear and is a part of the “In the Secret Garden” theme group. The Baby Frog was introduced in 2002, but is current so it can be purchased at the online shoppe for $50. The Swarovski Baby Frog identification #’s are 7642 000 002 / 286 313. Swarovski Prince Frog (Black Eyes) – This Swarovski frog has a clear body, a clear crown, and black eyes. The Prince Frog was introduced in 1984, and this variation was retired in 1991. Because of the timeframe it was produced, it can be found with either of the Swarovski logo markings: Block SC logo OR Swan logo. Swarovski Prince Frog (Clear Eyes) – This Swarovski frog has a clear body,a clear crown, and clear eyes. It has the same crystal body as the black-eyed Prince Frog, but with different eyes. This variation of the Prince Frog was discontinued in 1985, and for this reason, an authentic variation can be found with only the old Block SC logo. Swarovski crystal fanatics should use caution when purchasing a Prince Frog with Clear Eyes, paying close attention to possible eye alteration and the logo to ensure that is is an original Swarovski factory creation. So, if you are considering to purchase this army of leap frogs, they can be found at the Crystal Exchange America in the Swarovski Sea Life category. The Frog starts at $65. The Baby Frog starts at $35. The Prince Frog starts at $200 for one with clear eyes and $65 for one with black eyes. Swarovski has officially announced that the House of Cats are gaining some new members in the Lovlots City community. Swarovski Alexander – This Lovlots House of Cats figurine is a grayish kitten. Lovlots Alexander is a 2012 introduction and will retail for $205. Swarovski Andy – This Lovlots House of Cats figurine is a light emerald kitten. Lovlots Andy is a 2012 introduction and will retail for $80. Swarovski Camille – This Lovlots House of Cats figurine is a copper cat. Lovlots Camille retired in 2011. Swarovski Diane – This Lovlots House of Cats figurine is a golden shadow cat. Lovlots Diane retired in 2011. Swarovski Emily – This Lovlots House of Cats figurine is a cat. Lovlots Emily presently retails for $60. Swarovski Ines – This Lovlots House of Cats figurine is a cat. Lovlots Emily presently retails for $90. Swarovski Katie – This Lovlots House of Cats figurine is a light violet kitten and sports a pearlish pink bow atop her head. Lovlots Katie is a 2012 introduction and will retail for $60. Swarovski Pierre & Marie – These Lovlots House of Cats figurines are sapphire and hot pink cats. Lovlots Pierre & Marie retired in 2011. Swarovski Tom – This Lovlots House of Cats figurine is a light sapphire kitten. Lovlots Tom is a 2012 introduction and will retail for $75. Per the crystal giant’s site article, the four new figurines in the Swarovski House of Cats will be available for purchase in their online shoppe on March 5, 2012. Swarovski crystal fanatics can find a comprehensive listing of Swarovski Lovlots crystal figurines at Crystal Exchange America. Collectors looking to purchase retired or discontinued Swarovski Lovlots, should look at Crystal Exchange America in the category “Lovlots and Zodiac”. Swarovski has officially announced that the Birds on Broadway are becoming part of the Lovlots City community. Swarovski Audrey – This Lovlots Birds on Broadway figurine is a clear swan. Lovlots Audrey will retail for $180. Swarovski Ginger – This Lovlots Birds on Broadway figurine is a fuscia-colored crane. Lovlots Ginger will retail for $100. Swarovski Jim & Jess – These Lovlots Birds on Broadway are singing and dancing birds. Jess is yellow and Jim is lavender. Lovlots Jim and Jess will retail for $110. Swarovski Fred – This Lovlots Birds on Broadway figurine is the Limited Edition figurine for the Birds on Broadway collection. Lovlots Fred is a vulture and will retail for $80. Lovlots Fred will only be available in 2012. Swarovski Jenna – This Lovlots Birds on Broadway figurine is a pink girly-girl baby bird. Lovlots Jenna will retail for $50. Swarovski Justin – This Lovlots Birds on Broadway figurine is a light blue baby bird. Lovlots Justin will retail for $50. According to the article on the crystal brand’s site, the Swarovski Birds on Broadway will be available for purchase in their online shoppe on March 5, 2012. Swarovski crystal fanatics can find a complete list of Swarovski Lovlots crystal figurines at Crystal Exchange America. Collectors looking to purchase retired or discontinued Swarovski Lovlots figurines, can find them at Crystal Exchange America in the category “Lovlots and Zodiac”. Valentine’s Day is just around the corner, and you may be searching for that ideal gift for that special someone in your life. Well, if that special someone is among the community of Swarovski fanatics, a Swarovski heart may be a gift to consider purchasing. Swarovski Love Heart, Kakadu Red, large – 1096730. This crystal heart is about 2.5” high and retails for $165 in the online shoppe. 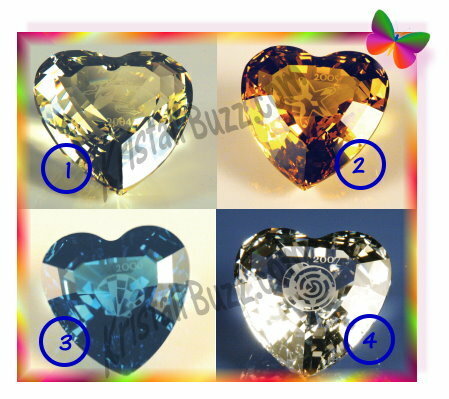 Despite the colorful description, the heart in the picture on the Swarovski site appears to be pink on the left side, and mauve on the right side. Swarovski Love Heart, Light Siam, medium – 1096728. This Swarovski heart is about 1.75” high and has a price tag of $95 on the online shoppe. According to the image on the crystal brand’s site, the left side appears pink and the right side appears red. Swarovski Love Heart, Light Siam, small – 1096727. It measures 1″ high (but is indicated on the Swarovski shoppe with a height of 2”) and it costs only $48. This Swarovski heart is all red, but divided in half, which slightly different shades on the left and right sides. Swarovski Love Heart, Crystal Silver Shade, medium – 1096729. This Swarovski crystal heart is not pink or red; instead the left side is clear and the right side more of a light grey (Swarovski calls it silver shade). Then there are about 10 hearts laser engraved on the crystal heart figurine. This special heart retails for $95 in the Swarovski shoppe. 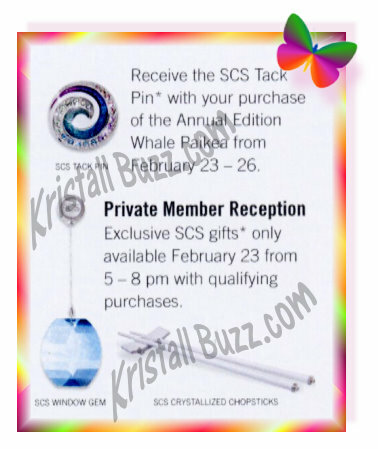 If your special someone is a new Swarovski crystal collector, you may want to consider the retired Swarovski heart figurines that were available exclusively to Swarovski SCS members in the 1990’s. These Swarovski hearts are a single crystal stone and have a constant color throughout. Swarovski SCS Heart, Clear – 199 130. This Swarovski SCS Heart is clear in color and is just over 1.5” in height. It was not available for purchase, but was a gift to SCS members in 1996. The clear heart may be found with or without the Swarovski Swan logo. It can generally be purchased for $45 – $75 on the Crystal Exchange America website. Swarovski SCS Heart, Blue – 210 899. This Swarovski SCS Heart is blue in color and is just over 1.5” in height. It was not available for purchase, but was a gift to SCS members in 1997. The blue heart features the Swarovski Swan logo. It can generally be purchased for $55 – $75 on the Crystal Exchange America website. Swarovski SCS Heart, Red – 215 371. This Swarovski SCS Heart is red in color and is just over 1.5” in height. It was not available for purchase, but was a gift to SCS members in 1998. The red heart features the Swarovski Swan logo. It can generally be purchased for $40 – $60 on the Crystal Exchange America website. No matter which Swarovski heart catches your eye, or more importantly, you think will catch the eye of your loved one(s), be sure to get your order in soon to allow for a successful delivery!